As a child it is hard to understand the world beyond the immediacy of home, school and street. Those limited horizons present enough challenges for most 8 year olds. The wider adult world impinges only indirectly. A major political event is a matter for adults. Sensitive explanations of marital problems, serious illness or death are often kept from children whom, adults believe, are unprepared to cope with the emotions arising. So it was with me. In the 1950s I was a young boy from an English-speaking part of south Wales who found himself living in a monoglot Welsh village on the Llŷn peninsula. My primary concern was coping with the resultant playground tensions. I was proudly Welsh, but these children were quite different to the children of Cardiff, quite different to me. I became expert in the suspicions and misunderstandings that can arise between the Welsh-speaking Welsh and their English-speaking compatriots. I understood that these tensions were shared by many others, including my parents. There were other sources of friction: North against South, Socialist against Conservative, Church against Chapel, soccer against rugby. There were sometimes heated discussions about “Nationalism” and the language. To my parents thinking, the Welsh language, whilst honoured, was associated irrevocably with poverty and the sufferings of a past generation. The brighter future was written in English. I was “protected” from learning Welsh which “would be of no use in a proper career.” From the conversations of other adults I still heard mentions of Saunders Lewis, of Penyberth, of Tryweryn; all of which meant nothing. I did not understand, but I did sense, the bewilderment and injustice felt by those who had lived on this land for centuries speaking their own language and worshipping in their own way, but now felt under immediate threat. As a child I was partly aware of “adult” crises affecting neighbours and friends although my knowledge was limited to that which parents thought it right that a child should know. At the furthest periphery of my vision, my parents’ newspaper headlines noted the mighty political and social events of the day: Suez, the Hungarian Uprising, Sputnik, Rosa Parks, post-colonialism, the birth of the European Economic Community. Only Sputnik caught my imagination. The time when you are brought up imbues personal significance to any era, but the late 50s deserve special respect as a time of fundamental changes: political, economic, social, cultural and technological. I have spent much of the following half century trying to make sense of all I heard, saw and felt. I needed to trace some of the lines that connected local events I had witnessed with national or global changes. For example, I was joyfully aware of the pleasures of harvesting: of following the baler with a crowd of frolicking children in a manner which would never be permitted today. I did not understand that this new agricultural mechanisation was causing unemployment on the farms of Snowdonia, causing young men to leave the village to find work in the midlands. I greeted the arrival of television with glee but missed the reaction of the chapel minister who feared for the future of the language which he saw as in danger of being eclipsed by the twin rising planets of American cinema and the cut glass English of BBC TV Crystal Palace. I was oblivious to the significance of Suez and how it changed attitudes. Some longed to restore “Britain’s place in the World”. Those who had never loved the Empire rejoiced that the British bulldog was now toothless and the time had arrived for small nations to assert themselves. I was quite unaware that local people, some of whom where family friends, took heart from Suez as they sought to resist and reverse the one-way flow of governmental edict and cultural influence from England (and America) to Wales. They desired nothing less than the establishment of a Welsh national layer of Government which could focus on pressing Welsh problems. In the 1950s the urges for national expression were striving for definition. Modern Welsh commentators tend to trace the origins of devolution from the creation of the first Secretary of State for Wales in 1964. The birth of the language movement is dated often from Saunders Lewis’ famous broadcast “Tynged yr Iaith” (The Fate of the Language) in February 1962 and the subsequent formation of Cymdeithas yr Iaith (The Welsh Language Society). These were major events and milestones of significance, but they were not spontaneous occurrences. They arose out of the complex ferment of the 1950s. That they took form at all was due to the work of some astonishingly strong-willed individuals who lay foundations on which other would build. One of the “adult” crises of which I was partly aware affected Dafydd Williams. Dafydd was a successful young lawyer in Caernarfon, a leading member of the Labour Party and the youngest mayor the town had ever elected. He was also a friend and business associate of my father and the families frequently socialised. He had two pretty daughters for whom I developed a childhood affection. Through them, I became aware that Dafydd spent a lot of time in Cardiff at “important” meetings. The girls talked of a favourite “Wncl Huw” who often arrived with their father back from Cardiff with stories and presents. “Wncl Huw” , I eventually discovered, was Huw T. Edwards, the Chair of the Council for Wales and Dafydd Williams was his chosen successor. I read of the life and career of Huw T. Edwards who, in the opinion of many, is an unjustly neglected figure in the history of modern Wales. He could reasonable be credited as the grand father of devolution. Certainly in his own time be became known as “The Unofficial Prime Minister of Wales”. His importance lay in being the right man in the right place at the right time with the right talents. His years as a trade union leader had taught him the skills of a “fixer”. He had been a quarryman in North Wales and a miner in South Wales. He had stood on the picket lines in Tonypandy in 1910 facing the police batons. He had survived the trenches of Flanders and was decorated for bravery. He was a first-language Welsh speaker, an amateur poet and keen Eisteddfodwr. Most importantly he commanded the respect and trust of most sections of divided Wales: North and South, Welsh- and English- speaking, Socialist and Welsh Nationalist - even some Conservatives. Dafydd Williams and his wife Kitty had set up house at Plas y Bryn in Clynnog. This fine old house was a joy. In the company of the two girls I explored the house and garden, concocting ridiculous stories of secret passages and lost treasure. The house had an atmosphere of a place where things had, and would, happen. Years later I am able to explain from whence came its charisma. Originally built by Arthur Ackland, Liberal MP for Rotherham in the 1890s, the house was used as a place to retreat, plot and plan by turn-of-the century Liberal notables including Tom Ellis and Lloyd George. Unknown to us children, Daydd and Huw T. Edwards were continuing the house tradition into the 1950s. The two girls recall much coming and going at Plas y Bryn. The cars impressed them: Rovers, Wolseleys and even a Bentley. The names they recalled were the diminutives they were taught: “Fred Elwyn,” “Yncl Bill”, “Merv the Gas”. Dafydd and Huw T. Edwards were hosting gatherings of some very influential people. “Fred Elwyn” was Elwyn Jones (Nuremburg prosecutor and later Attorney General in Harold Wilson’s 1964 government), “Yncl Bill” was Sir William Mars Jones QC (prosecutor of the Moors Murderers and later High Court Judge), Mervyn the Gas was Mervyn Jones, Head of the Gas Board (and owner of the Bentley). There were also visits from Lyn Howell, Secretary of the Welsh Tourist Board, John Clement, Secretary to the Council for Wales, Clayton Russon, owner of Cuthberts Seeds, Goronwy Roberts MP, Cledwyn Hughes MP and many more.What political machinations were going on? Was this a faction within the Welsh Labour Party? Certainly it contained most of the Labour Party prime movers in the early campaigns for a Parliament for Wales, a cause that was not supported by the party grandees of the south, notably Aneurin Bevan. I had discovered a wealth of information. Most of it came from the published work of professional historians who had researched the period in depth. I leaned heavily on the work of Gwyn Jenkins, Paul Ward, Gwilym Prys Davies and Rhys Evans. Gwyn Jenkins, author of Prif Weinidog Ansyddogol Cymru, a life of Huw T Edwards, gave me access to unpublished interviews he had conducted in the 1980s. He also directed me to particularly fertile files in the National Library of Wales. Bit by bit the story became clearer, and what a story it was. I am not a professional historian and in any case much of what I wanted to charter was social rather than political history. The historians I mention have devoted a life-time of study to the period and anyone in quest of the historical narrative should first go to their work. If I had anything to offer it was to explore the emotional intelligence that drove the passions and sparked the conflicts of the time: to chart a way through the swirling miasma of events. My own background in theatre made me wish to dramatise events. I wanted to portray the complex attitudes and tensions within Welsh society in that period. I wanted to take a non-Welsh speaker into the minds of Welsh speakers of Arfon the 1950s. I wanted to portray the tension between those fighting to bring industry and jobs to rural areas and those whose first priority was to protect culture and landscape. I wanted to dramatise the political dilemma faced by those working towards a Parliament for Wales: whether it was best to work within the existing UK political parties or to move towards the nationalist route. 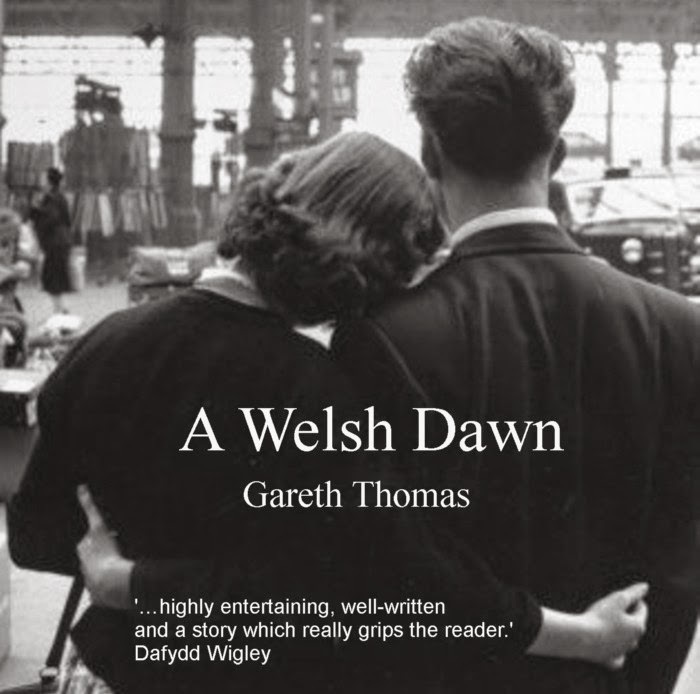 The result is a novel entitled A Welsh Dawn, which has taken five years to write. The political narrative that acts as the spine of the work is as correct as I could make it in spirit and factual detail. Much of the dialogue is first hand although the contexts are changed. The intention throughout was to dramatise and reconstruct the political context faithfully. I was astounded when Gwyn Jenkins provided me with access to recordings of interviews he had conducted with John Clement in the 1980s recalling, in detail, the private meetings of The Council for Wales including the dramatic resignations of Huw T Edwards and Dafydd Williams. These were invaluable in my efforts to recreate the political events of the time with accuracy. The title comes from a famous Welsh poem by Ceiriog, who is sometimes titled the “Welsh Wordsworth” for his success in restoring directness and simplicity to Welsh nineteenth century verse. The poem tells of how “with the dawn”, the old songs of Wales can still be heard but must be sung by the voice of a new generation. the song you hear the shepherd sing. Now sings the song and treads the path.